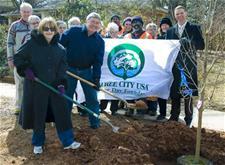 City residents and officials gathered Friday, February 20, for a commemorative planting to celebrate Georgia Arbor Day and Avondale Estates’ 31st year as a Tree City USA community. At the ceremony, held in front of 17 Kensington Road, Avondale Estates Commissioner John Quinn spoke about the significance of maintaining the Tree City title for over three decades, and thanked City staff and residents. The Avondale Estates Garden Club (AEGC) again donated funds for the purchase of a memorial tree for each member or spouse who passed away during the previous year. This year, they remembered late, longtime members Claudia Lowery and Ernelle Fife. Ms. Fife’s daughter, also named Ernelle Fife, attended the ceremony. Since its inception, Avondale Estates has been known for its lush trees, and the City’s greenery remained in the spotlight over the past year. Scores attended the AEGC’s second annual Tree Walk October 25, 2014, when six certified arborists took patrons on a free tour of the City’s trees. On Martin Luther King Jr. Day this year, the Avondale Estates Junior Youth Group planted 52 bushes, trees and other vegetation by Lake Avondale. Dedicated volunteers from the AEGC and the Avon Garden Club also hold regular plantings to beautify City spaces. The Tree City USA program, administered by the Arbor Day Foundation in Nebraska, provides the framework for community forestry management for cities across America that meet certain requirements. These requirements include the establishment of a tree board or department, a community tree ordinance, an annual community forestry budget of at least $2 per capita and an Arbor Day observance and proclamation. There are 138 Tree Cities in Georgia and more than 3,400 in the country. Avondale Estates is one of the three oldest tree cities in the state, and one of the few tree cities in DeKalb County. The City was honored during the State Arbor Day celebration February 18 at Wesleyan College in Macon, Ga. Arbor Day Foundation President Dan Lambe traveled to Georgia for the event. Lambe and Robert Farris, Director of the Georgia Forestry Commission, commended Avondale Estates and City Tree Board Chair Stephany Cross, who attended the state celebration. View more event photos on the City's Facebook page.